Of the more than ten thousand cannons owned by Serenissima at the time of its greatest splendor, there are only 186. The cannons of the Serenissima, important for at least 300 years, have been abandoned, lost, destroyed, after 1797. And there is no trace of where they are finished. A study conducted by the archaeologist Carlo Beltrame and by Professor Marco Morin is trying to shed light on this mystery. The cannons were mostly on board ships of war, the galee. There is not one of these ships arrive until today. The same Venice Naval History Museum holds only 17 cannons, one of which is at the entrance. 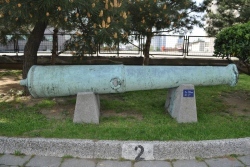 The Arsenal housed thousands of cannons, but Napoleon Bonaparte made a clean sweep. He reduced them into pieces and sold as a metal to be fused to a Genoese merchant. Through preliminary research conducted via the internet pieces were found in Athens, Cefalonia, Ithaca, Corfu.